Mud Run Guide was in touch with Kevin Jones, Chief Marketing Officer at BattleFrog, yesterday regarding the refunds and the still outstanding virtual race swag and season pass holders. He followed up with these updates from BattleFrog Series. As of September 16, BattleFrog has completed processing most of the refunds for registrations as well as completed payments for the 2016 Elite Point Series. All payments to BattleFrog Ambassadors have been processed. For those that may have had a credit card change since registering, your refund was sent to the original account. Your bank will take care of re-routing the funds for you. For those that registered for the Virtual Run that was held over the weekend of 8/20, all medals and shirts are being processed and will be shipped very soon. There will be no refunds for the Virtual Run. This week we are processing refunds for all season pass holders. On January 18, 2016, BattleFrog switched to Race IT as the registration service provider. Upon announcement of the shutdown and declaring 30 days for refunds, all registrations prior to the switch were not able to be accomplished by crediting to the original card but will need to be completed by check. To speed up the process, we ask that anyone who purchased a registration prior to January 18, 2016 to please email info@battlefrogteam.com with their registration confirmation and include their mailing address. If your registration was purchased after January 18, we ask that you please double check your credit card for the refund before you contact us. As you can imagine, this is a very difficult time for us as we work diligently to process refunds and payments to everyone. We greatly appreciate your patience and consideration. In the OCR landscape, we do not often see companies making good on their promises after closing the doors to events. This has not been the case with BattleFrog and those in the community are pleasantly surprised and happy to see BattleFrog follow through with their promises and not just cut and run, which has become all too familiar in the industry. Mud Run Guide recently received this comment on the original article announcing the news of the company restructure. This same sentiment has been echoed throughout the community. For those who were initially disappointed in the BattleFrog restructure, this makes the news sting a little less and offer hope for the future. Ive sent a total of 6 emails with only a canned email response once telling me to contact raceit. I am one of the unlucky few I guess who will get penalized for ordering tickets early. I purchased my tickets in 9-2015 for the Oct 29th 2016 Richmond event. I still have yet to receive my refund either. Nor have any of the members of the team I had put together (9 people). At least it was a cheap race and not a legitimate race that costs north of $100. I called and left messages. I sent emails which redirect me to Raceit which then they redirect me to Battlefrog. So unfortunately I too am one of those that have yet to get paid and being sent in a circle. yep still to receive my refund to my bank account either. still waiting for my money. i’m guessing the battlecry changed from never quit to never getting your money back. After multiple requests, I never received my refund either – I paid in November 2015 for an October 2016 race that never happened. After my most recent nasty email, I received an auto-response that no one was left to monitor the account. Guess I won’t be getting my $130 back!!! Unfortunate. Same story here. I got an email from Battlefrog saying I would get my check nin 10-14 days. That was over a month ago. Same story here. I got an email from Battlefrog saying I would get my refund check in 10-14 days. That was over a month ago. I haven’t received my refund either and emailing or calling you get no response. This has been ongoing since Sept. They most certainly did not send out the race packets for the virtual race. They sent an email stating they would be shipped out shortly and that was the last we have heard. No replies to emails, calls etc and no packets being received by anyone. Ridiculous, They have not made good on much of anything. What they did do is steal from the participants that paid their race fees and received nothing for it when they decided to close up shop. They said Virtual Run III would not be refunded as the items were going to be mailed out but no one has received anything as of yet. Still waiting and they are not responding any longer. I still have not received my refund. I paid in January 2016 for an event in October 2016. 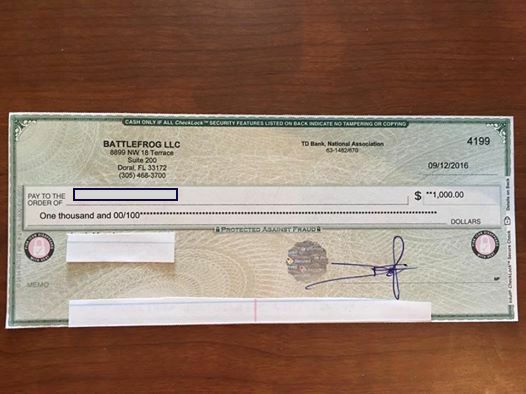 I did email Battlefrog, as instructed, with a copy of my original registration along with my address to mail my refund check. Still no refund. And like everyone else in the same situation no one is responding to emails or phone calls. Terrible customer service. Like most people here I too expected a refund check as I had paid in advance a year ago for a race that was canceled. I emailed them on Sept 28 and received an auto response that my check would come in 10-14 business days for my owed amount of $86.74. I’ll never purchase one of these races in advance again if I don’t get the refund. BattleFrog needs to make amends with their loyal customers! I received one refund check addressed to my 4 year old daughter for $25 but still short $100 for mom and dad. Maybe I should be grateful for a partial refund. I have not received my refund. They owe me $205. Plus no one in our group has received theirs either. Several corespondences back and forth saying it would be paid.